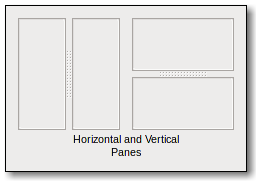 GtkPaned is the base class for widgets with two panes, arranged either horizontally (GtkHPaned) or vertically (GtkVPaned). Child widgets are added to the panes of the widget with gtk_paned_pack1() and gtk_paned_pack2(). The division beween the two children is set by default from the size requests of the children, but it can be adjusted by the user. Each child has two options that can be set, resize and shrink. If resize is true, then when the GtkPaned is resized, that child will expand or shrink along with the paned widget. If shrink is true, then when that child can be made smaller than its requisition by the user. Setting shrink to FALSE allows the application to set a minimum size. If resize is false for both children, then this is treated as if resize is true for both children. Example 45. Creating a paned widget with minimum sizes. In older versions of GTK+, this function used to set the width of the gutter (the area between the two panes). It does nothing now.